My son is getting married in a couple of weeks. We are all very excited as we love my future daughter in law and her family. The entire event will be outside, from 4 – 10 pm in Massachusetts. The weather could be chilly and rainy or could be warm and sunny; what to wear? Over the summer I asked my friend Eddi Phillps to design some clothes for me to wear on a book tour (still in the planning stages.) Eddi sketched 10 beautiful designs; we selected 6 for me make. Eddi also helped me choose fabrics from my stash to use in this project. 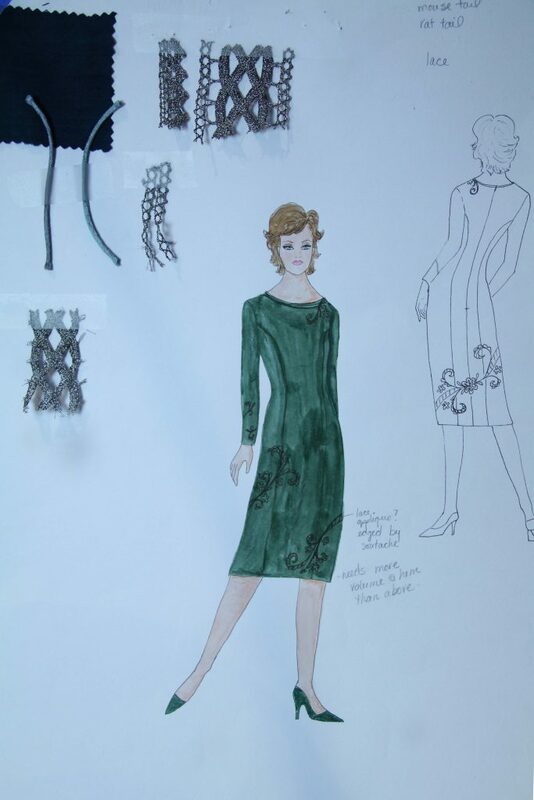 I chose this dress design for my Mother of the Groom dress. 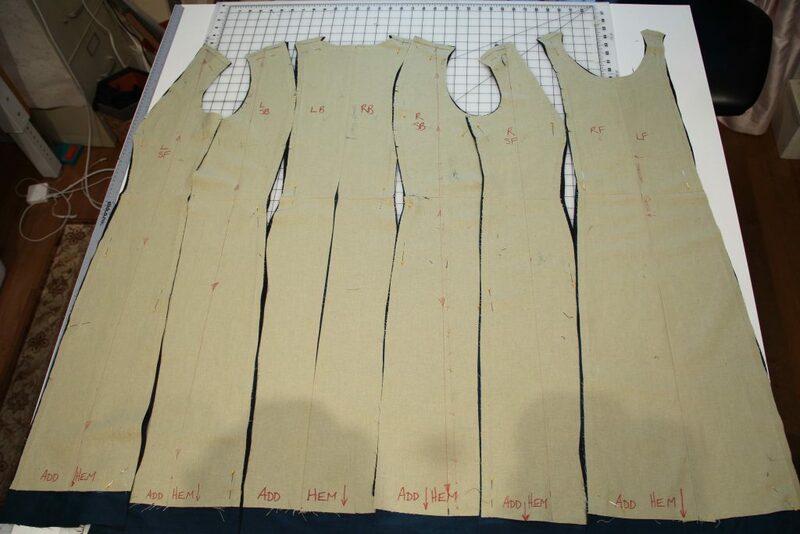 I started by adapting my muslin from the shirtwaist dress pattern (in post #3) to a shoulder princess line dress. I sewed the bodice pieces to their corresponding skirt pieces and fiddled with vertical seams until the pieces laid flat on the worktable. The center back seam opened so the pieces can lay flat. All the pieces laid out in order. I cut out the lining in a dark Bemburg rayon; I love the feel of the Bemburg against my skin and it sews up beautifully. 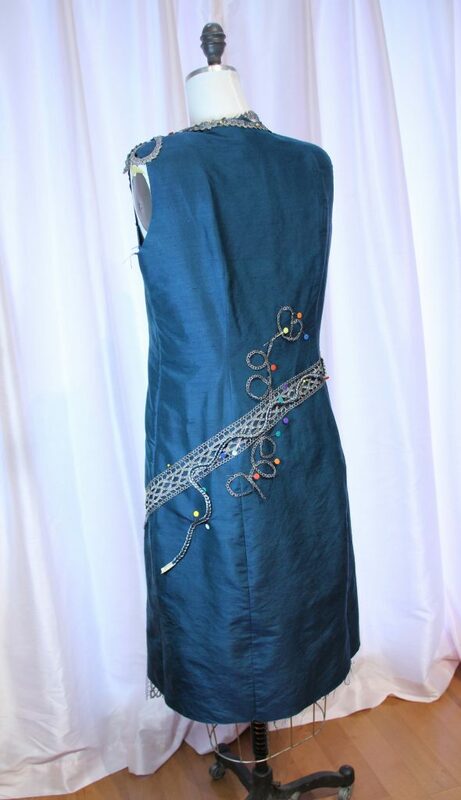 After sewing the dress and lining I put the dress on my dress form and started to pin the trims in place. The trims are from Daytona Trimmings Co. in New York City; they don’t have a web site. 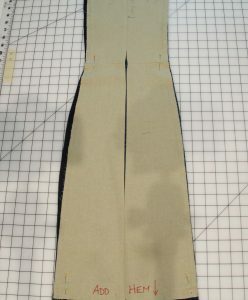 Trim pinned to the back of the dress.